Dave Matthews Band, sometimes shortened to DMB, is an American rock band formed in Charlottesville, Virginia in 1991. Founding members were singer-songwriter and guitarist Dave Matthews, bassist Stefan Lessard, drummer/backing vocalist Carter Beauford and saxophonist LeRoi Moore. Boyd Tinsley was added to the band as a violinist soon after the band was formed. Moore died suddenly in August 2008 due to complications from an ATV accident. Grammy Award-winner Jeff Coffin, of Béla Fleck and the Flecktones, has since filled Moore's spot as the band's saxophonist. Rashawn Ross and Tim Reynolds have also become full-time touring members of the band. With musicians who each have roots in differing genres, including jazz, classical, soul, rock, bluegrass, and hip-hop, the band has come together to create an eclectic sound which has earned them fans from a variety of quarters. 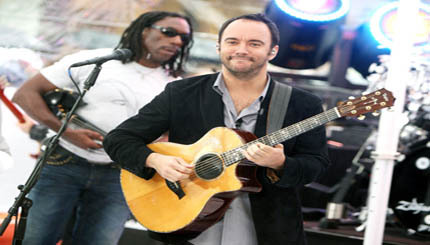 As of 2010, Dave Matthews Band have approximate sales between 30 and 40 million copies worldwide.